Compost tea is a brown liquid which has been actively aerated, it’s produced “by extracting bacteria, fungi, protozoa and nematodes (all members of the soil foodweb) from compost.” However, compared to compost, it’s an incredibly efficient method of injecting valuable nutrients into your soil (and plant foliage) and creating and/or maintaining the soil foodweb in your soil across small or large areas of land. Dr Elaine Ingham, founder of the Soil Foodweb Institute, is responsible for flying its flag in a major way, traveling the world educating people and working with farmers to integrate it into their land management systems. 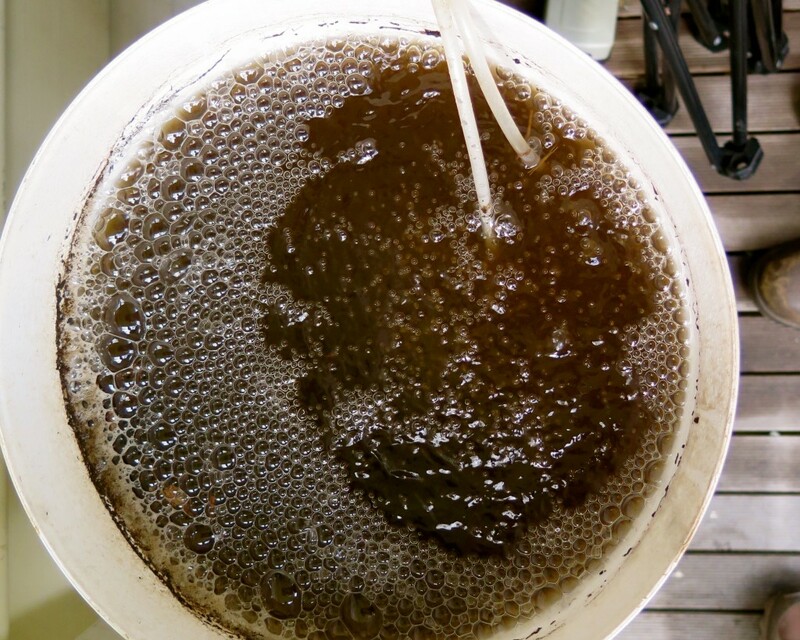 What’s the difference between compost tea & plant/manure tea? Pant/manure tea is the age-old practice of soaking manures or a range of plants in a vessel of water where they leach their nutrients into the water. This can include compost, beneficial plants (comfrey, borage, dandelion to name a few), fish guts and animal manures. It’s then left to ‘stew’ for up to one month in which time it becomes incredibly stinky, indicating that it’s gone anaerobic. I remember working on a farm and having to spread very mature plant tea around the market garden… No matter how many swims I had in the dam I stank for days. In contrast, compost tea is an aerated brew which doesn’t smell bad (at all) and is usually ready between 24-48 hours depending on the weather and ingredients. The liquid is aerated through an air blower (or fish pump), or if you have no power by stirring it vigorously regularly. By getting air into the liquid, the right environment is created for diverse soil foodweb to form. So while both provide nutrients, the compost tea also provides *life* to the soil – and that’s what we’re after. 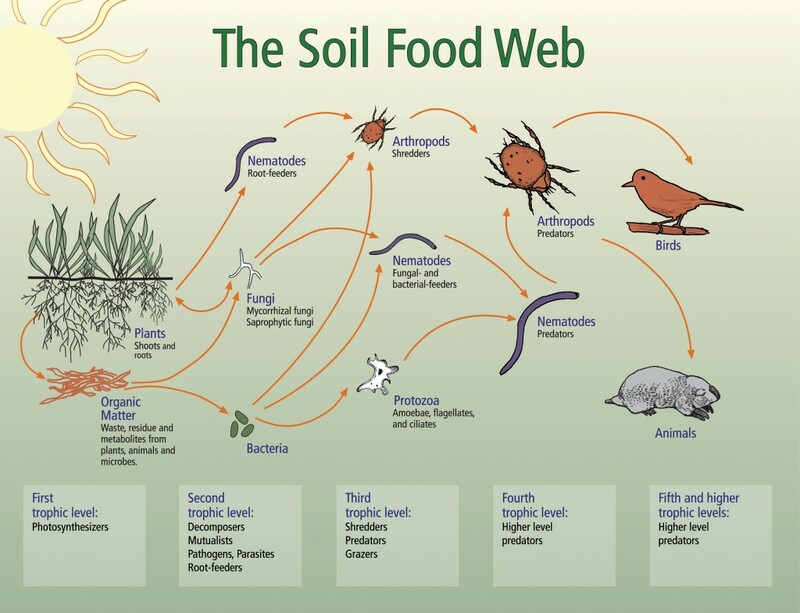 What’s the soil food web? It’s a complex collection of a trillion or so life forms including bacteria, protazoa, fungi, nematodes, cilliates etc. It describes the relationships between them and how they form a whole system which cycles nutrients through the layers of the soil, making them available to plants and other life forms, above and below the ground. You can read more about it here. When you think about the type of compost tea you’d like to make, think about what crop you’re trying to grow, this will determine the ingredients you need to put into your brew. For example all annual vegetables naturally thrive in a bacteria rich environment, whereas orchards and other tree crops naturally evolve when fungi dominates. 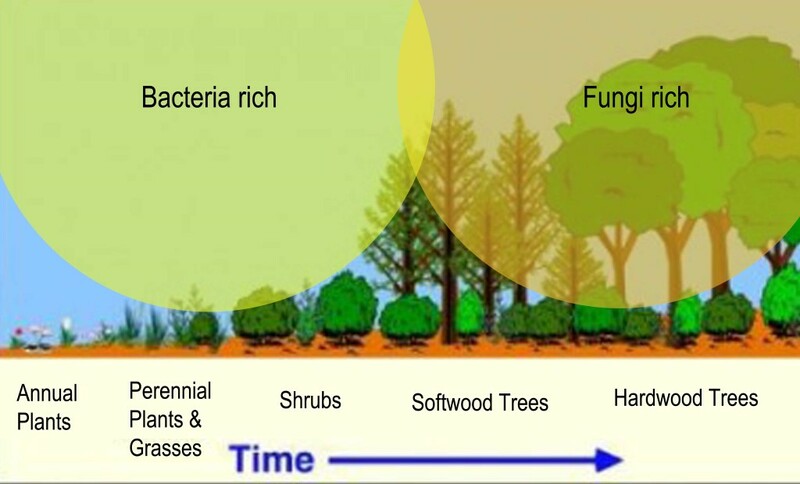 If you check out the basic ecological succession chart below you can see the stages of succession and the areas where bacteria and fungi naturally flourish. There are a hell-of-lot more complexities and overlaps going on than this chart shows, but it gives you a general sense. When making compost tea, you can tailor the tea to suit the crop you’re growing. So if you’re growing annual vegetables, make a compost tea with more bacteria and if your growing tree crops, favour the fungi. Ingredients which foster bacteria are nitrogen materials including manures and plant foliage, to attract fungi include carbon ingredients like wood chips. However, a good compost will have a healthy balance of bacteria and fungi suited for any crop. And fungi is the ultimate soil life form for any crop – in our own garden we actually put a significant amount of carbon into our annual crops by using ramial wood chips to attract fungi… I told you it was complex. To simplify it, here are two recipes and some great resources for you to go through. Elaine Ingham has a basic recipe on her website which is centred around having *really* good compost, and a microscope. 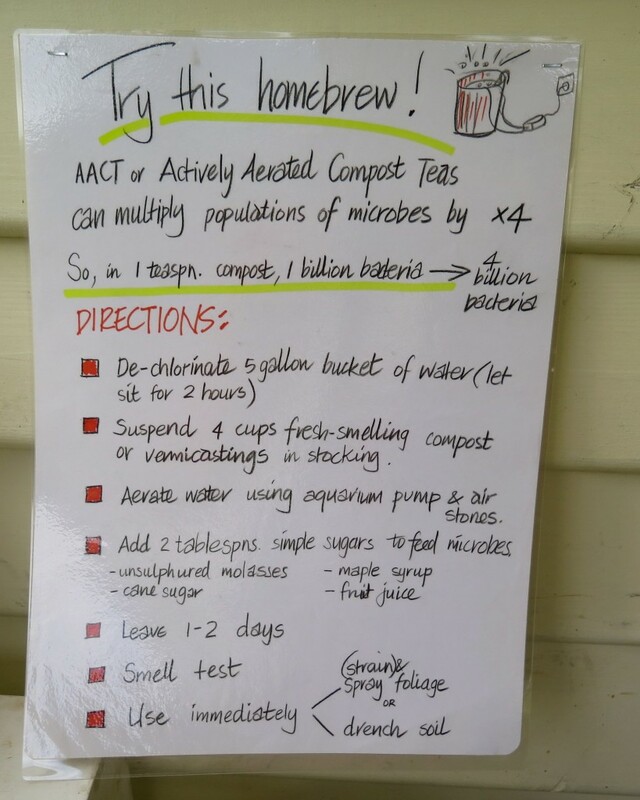 If you’re after something a bit more approachable, Hobart market gardener, Suzi Lam, has shared her recipe with us below. 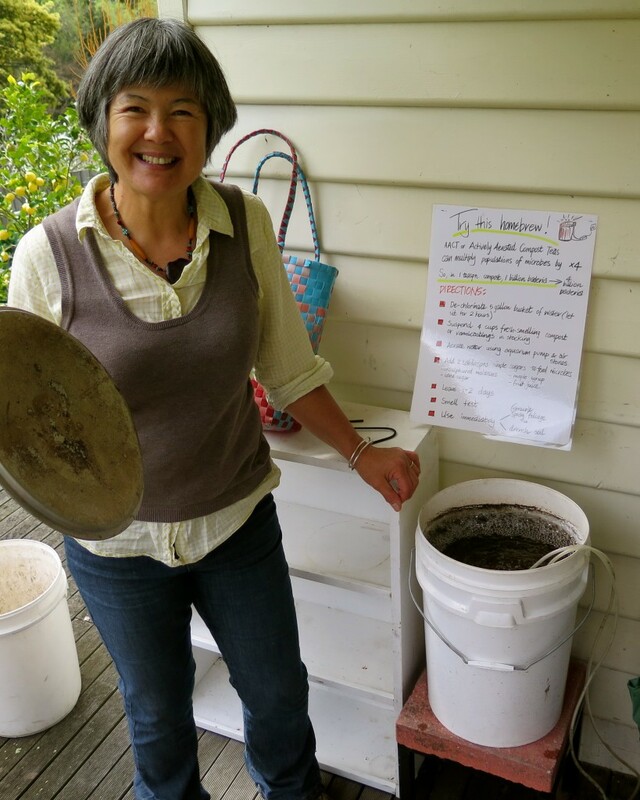 Suzi brews her compost tea in a 20 litre bucket for up to 48 hours and dilutes it to (approx. 10:1) to water her 1/4 acre market garden. It’s important to note that you need dechlorinated water, if you’re on town water, simply leave a bucket of water out for 24 hours for the chlorine to evaporate before you make your brew. A good looking brew in process, those bubbles are a good indicator that things are going well, the other main indicator is the smell – it should smell sweet and earth. An important tip is to clean all the materials thoroughly after you’ve finished so there’s no ‘scum’ left on the bucket for air blower, otherwise there’s risk of contamination for the next brew. Everything needs to be clean and fresh, you can use hot water and elbow grease to clean. Can you put too much compost tea on your garden? No, however there’s no need to do it every week, make and apply compost tea strategically to help get a crop started or just before fruiting. 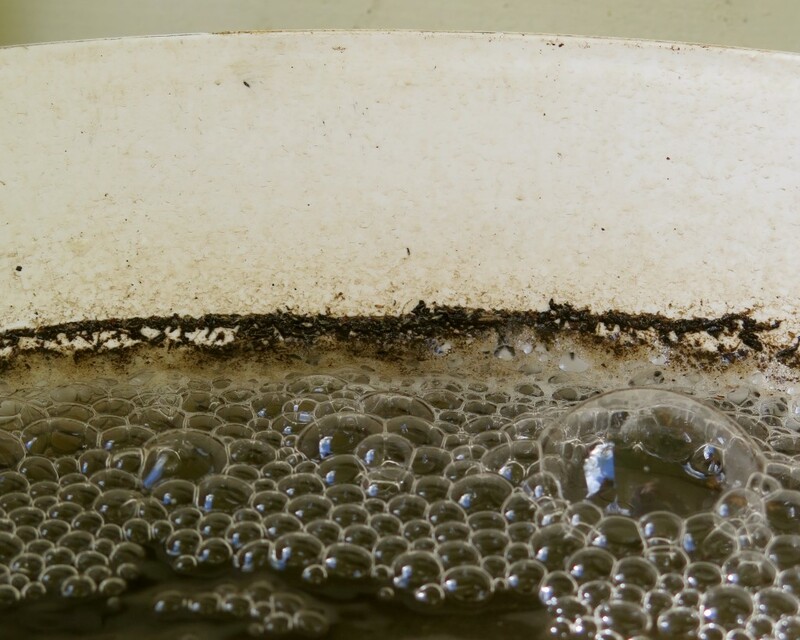 Is compost tea the answer to all soil problems? Some people say yes, but we think no. Specifically, it does not resolve mineral imbalances, it may help – but as far we understand things, it cannot fix it. We recommend approaching soil remediation by first doing a soil test to determine the mineral/nutrient content and then using a range of methods which can include compost, compost tea and possibly (depending on scale and context) applying some minerals to help bring everything back into balance. A good book to read about using minerals and growing nutrient dense food is The Intelligent Gardener by Steve Solomon.